On August 17th we attended the Tony Stewart Smoke Show at the Texas Motor Speedway, to benefit Speedway Children’s Charities. The charity was founded to care for children in educational, financial, social, and medial need in an effort to help them live productive lives. We donated two custom revolvers engraved with Tony Stewart’s signature and Speedway Children’s Charities logo for the charity’s auction. We are very pleased to say that the pair of revolvers raised $35,000 for the charity! All together the auction raised $250,000 for Speedway Children’s Charities. We both had the opportunity to drive 10 laps at the Texas Motor Speedway and ride with Tony Stewart in a Sprint Cup Series car. Doug got up to 136 MPH . The event also included a personalized fire suit and helmet that we were able to take home. After participants had the chance to race around the track in a stock car they celebrated by shooting off our Turnbull Mfg. 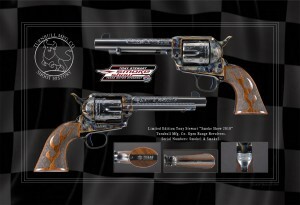 Co. custom revolvers in Victory Lane. Following the racing was a question and answer dinner for 200 people featuring Tony Stewart. The dinner and Speedway Children’s Charities auction was held at the House of Blues in Dallas. Auction items included autographed NASCAR memorabilia, and the Turnbull Mfg. Co. custom revolvers. After dinner musical entertainment was provided by the Goo Goo Dolls. This event was an amazing experience for us. We are already looking forward to attending next year.